Today’s episode starts with housemates talking about the recent incident of stealing ration (sugar and milk) in the house. Everyone is disappointed that Karanvir hides ration and they have to ask him every time for it. However, KV treats Deepak and Rohit and provide them with everything. All housemates discuss about Sreesanth, Dipika and Megha. Sreesanth clarifies that whatever he said last week was not intentional and the words came out just in anger. Romil asks Sreesanth to clarify his stand and apologise to Surbhi as she is hurt. Romil and Dipika even try their best to make Sreesanth understand that he should apologize to Surbhi for doing her ‘character assassination’. Sreesanth in anger, says sorry to Surbhi but KV and Somi don’t feel it was from his heart. On the other hand, Surbhi can be seen crying in the house and Karanvir goes to calm her. Somi can be seen talking to Romil about Surbhi and Sreesanth’s fight where he questioned Surbhi’s character. Karanvir is asking Surbhi to calm down and says everything will be fine. Dipika goes to Sreesanth and says that he should genuinely say sorry and not like he is doing her a favour. Sreesanth says he doesn’t want to apologise. Karanvir and Sreesanth are fighting with each other. KV further announces that Sreesanth has lost all respect. 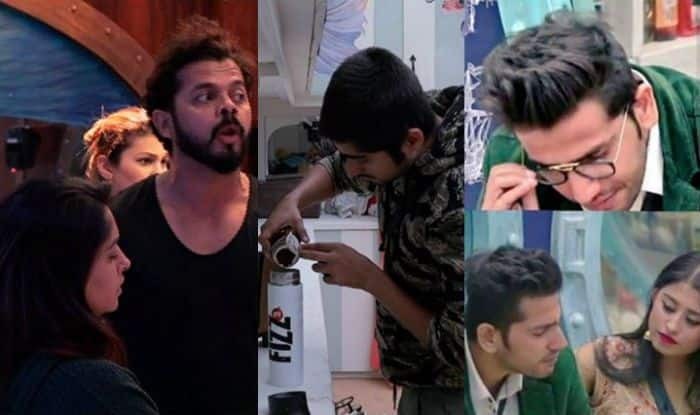 They threaten each other and Sreesanth blamed KV that he is filling Dipika’s ears. Surbhi now enters the fight and says she wants to end the discussions now. Deepak and Rohit steal ration such as milk, coffee and sugar. They can be seen having a good laugh in the washroom. Dipika catches them red-handed in the washroom. She then informs Somi and she gets to know who is the real thief. KV and Surbhi are walking in the garden. Rohit comes to them and informs that Somi knows. Megha accuses Rohit and Deepak of using too much sugar. Rohit and Deepak argue with Jasleen and Megha about ration. KV comes to defend them. Megha calls Rohit ill-mannered. This results in a huge fight. Jasleen is saying she will hit Rohit with a mop and Megha says she will slap both of them. Jasleen loses control and shouts on them and starts shouting and crying. Somi is upset with Romil when he says that it doesn’t affect her as she has a soft corner towards Deepak and Rohit. Here, Romil is questioning Somi about her closeness with Deepak and Rohit. A new day begins with the song ‘Bluffmaster’. Somi enters the living area and Surbhi, Deepak and Rohit praise her that she is looking beautiful. Deepak keeps flirting with Somi and she blushes. All of a sudden, Rohit joins in and flirts with Somi. Romil and Somi talk about their fight and Romil finish his relationship with Somi as she said she is tortured by Romil emotionally.